Army files FIR against Airtel & ATSUM: [July 24, 2016]: The Indian Army filed two FIR in the Police station of Bishnupur, Manipur on the date of July 24. 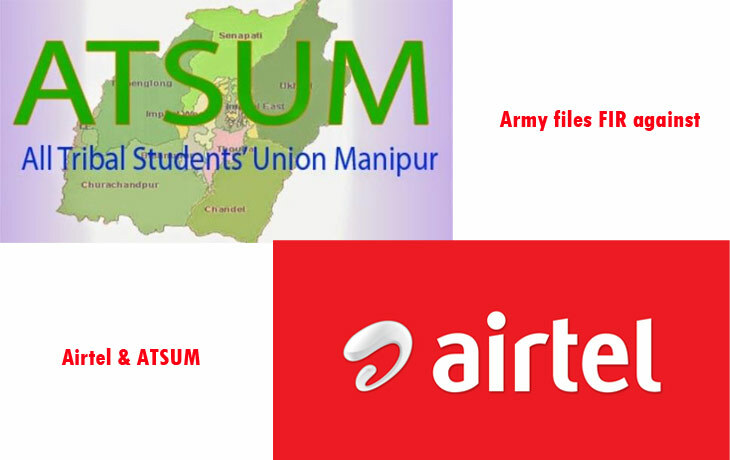 That two FIR against the ATSUM (All Tribal Students Union Manipur) and another one are against AIRTEL. Micah Kamei is the distributor and publicity secretary of ATSUM. The AIRTEL network didn’t hold the TRAI regulation. They distributed preactivated sim cards without any proper verification. According to the press release today, (July 25, 2016): Press Information Bureau (PIB), the concern security forces were involved in this issue about the pre-activated SIM cards in the location of Tamenglong district (Khoupum Valley) without any proper documents and verifications. Also, they took action aginst the leading telecom company in India. As per the rules of TRAI, all the Telecom companies should follow the rules and regulations under the TRAI. Under the rule, a company should verify the customer’s identity with the help of residence proof. But, AIRTEL didn’t follow that law in this process. They distributed the SIM cards in the village of Khoupum Valley without any proper documents and verifications. The Press release added that, due to this process, the maximum of the SIM cards were reached to the wrong hands, and it creates the way for the imminent violence. The State Police of Manipur has been contributing to this issue along with the Defence.